The Pharaoh Hound is a very loving, sweet, and tender dog which makes it a great choice for a family with children. It also gets along very well with other dogs; however, it tends to chase around animals that it is unfamiliar with. The Pharaoh is a very independent breed but has the innate desire to please its owners and its family. A very unique characteristic of this breed is that is blushes when it is excited and happy. Its ears and the tip of its nose actually turn a rosy color. This is a great family pet and adores to be surrounded by its family. The Pharaoh Hound loves to stretch out and relax, as long as it feels as tough it is in a safe and secure area. It can get an adequate amount of exercise by being taken on a long walk every single day, paired up with occasional sprinting activities and games. When it comes to sleeping, the Pharaoh Hound can be very similar to the old tale, The Princess and the Pea. It requires very soft bedding in order to get a decent amount of sleep, accompanied with much warmth. It should not sleep outside unless the climate is very warm. Even if the climate is warm and feasible for sleeping, it would still prefer to sleep indoors snuggled up with its owner and family. The coat maintenance of the Pharaoh Hound is very low maintenance and only requires brushing once a week to keep its coat under control. When it comes to major health concerns, there are none that typically surround this breed. The same goes for minor health concerns. As a whole, the breed is particularly healthy; especially compared to other dog breeds. There are no trends in any type of condition that is occasionally seen either. However, if your dog does begin to show signs of sickness or discomfort, it is very important that he or she is taken to your local vet for an examination. This is the best way to ensure long-lasting health within your dog. The only thing that needs to be noted when referring to the breed’s health is that the breed has a particular sensitivity to barbiturate anesthesia. The history of this breed cannot be discussed without mentioning its ability to hunt. 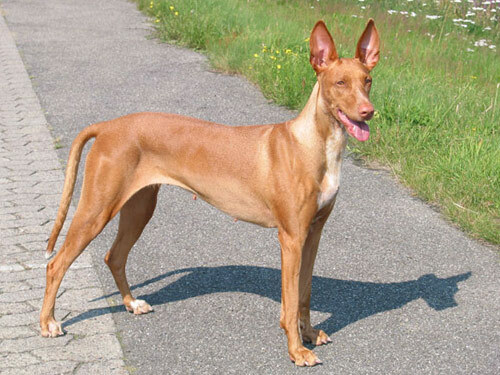 The Pharaoh Hound comes form the Egyptian Dynasty. Their ability to blush dates back to their origin thousands of years ago. The breed is legitimately one of the most-ancient dog breeds known of to this day. Its appearance has changed very little from what was documented throughout the last 3000 years. It resembles the jackal god Anubis as well as the dogs depicted on ancient tombs of Egyptian Pharaohs. This dog breed was featured in Greek art as well. It is currently the National dog of Malta. During the 1960s, the breed was brought to England after being rediscovered after a vast amount of time. It was then brought to American soil and was recognized by the AKC in 1983.